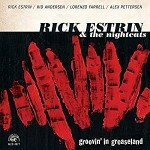 Share the post "Album review: RICK ESTRIN & THE NIGHTCATS – Groovin’ In Greaseland"
Rick Estrin has lived a lifetime of the blues. He’s old enough to have known Muddy Waters and came within a missed phone call of working for him. But he’s also young enough to pen songs with rib tickling contemporary relevance. He’s an indefatigable, big toned harp player who always seeks to make an emotional connection with his playing. He’s a colourful performer, sharp of suit and pompadour and has a locker full of stories that mirror his own colourful on stage personality. He’s also a vocalist whose limited range has been subjugated and transformed into a unique vocal style. His subtle phrasing draws the listener into the nuance of a phrase and the feel of a song. Estrin derives his feel from a lifetime’s experience and imagination. His special ability to share those moments humorously and simply gives his songs their luminosity. This album could easily have taken its title from the opening track, the ambivalently titled ‘The Blues Ain’t Going Nowhere’. Both the song itself and Estrin’s durable 45 year career pour scorn on any negative interpretation of the song title, as Estrin shares the kind of universal feelings and range of emotions that continue to draw in generations of music fans. His singing is unique as it is humorous. He rarely stays long in any one emotional channel, as he moves from the double-time swing of ‘Hot In Here’, to the heartfelt slow blues of ‘Another Lonesome Day’ and the apparent autobiographical reflection of the harp-led ‘Tired Of Living Hand To Mouth’. Estrin has spent over a quarter of a century on the Alligator label, which has nurtured his talent and enhanced his artistic development to the point that he has successfully re-positioned his band on the blues scene. Since the departure of Little Charlie (Baty), the band has become more song driven and enjoys a wider musical scope. There’s a notable shift from swing – though that remains a core element in the band’s make-up – towards more expressive story telling blues style that treads a thin line between the autobiographical and sheer fiction. Put it this way, if Rick Estrin didn’t exist the blues world would have to invent him. He’s a showman who straddles generations with his flamboyant style, his all encompassing musical approach and songs that are touched by irony and even parody, but ultimately remain faithful to the blues. The Nightcats feature Norwegians Kid Andersen on guitar (who also co- produced the album) and drummer Alex Petterson, alongside long time keyboard player Lorenzo Farrell, with Joe Kyle Jr handling the bass parts on 6 of the tracks. Both ‘Dissed Again’ – featuring the Estrin/Kid Andersen harp/guitar axis – and the subtly paced ‘Living Hand To Mouth’, might be a shade too close to home for a blues musician who has consistently made his living in blues clubs, but they are both perfect examples of his craft. If his vocals sometimes display a sense of vulnerability, they are offset by the humorous twist and turns of his narratives. And it’s while exploring his unique lyrical and musical perspective that you realize Estrin’s real talent lies in his ability to focus on the minutiae of our everyday emotions and being able to express them in a way that everyone can relate to. ‘Groovin’ In Greaseland’ is what happens when Estrin’s unique persona meets Kid Andersen’s slick band arrangements and conversational guitar solos. The latter perfectly matches the feel of the Estrin songs over a seamless rhythm section. The band grooves, percolates, swings and is versatile enough to handle plenty of variety. This is exemplified by the use of space, dynamics and Estrin’s immaculate harp on the reflective cynicism of ‘Tender Hearted’, which suddenly gives way to an Anderson instrumental homage to the late Lonnie Mack. Then there’s the mid-album stomping shuffle of ‘I Aint All That’ and the low-down blues of ‘Another Lonesome Day’, notable for Estrin’s precise diction. The album also has three instrumentals, which don’t so much suggest a paucity of ideas as merely providing a showcase for Estrin’s ability to make an emotional connection with his harp. The Lorenzo Farrell penned ‘Cool Slaw’ is a Booker T influenced desultory shuffle, which Estrin only joins halfway way through with some country tinged lyrical harp, while his harp phrasing on the closing ‘So Long (for Jay P.)’ is a signature style that he has honed in over 45 years of treading the boards. This entry was posted in ALBUM REVIEWS, ALBUM REVIEWS (Mobile), All Posts and tagged album, Alex Pettersen, blues, Booker T, Charlie Baty, harp, Joe Kyle Jr, Kid Andersen, Lonnie Mack, Lorenzo Farrell, Muddy Waters, review, Rick Estrin, Rick Estrin & The Nightcats, swing. Bookmark the permalink.